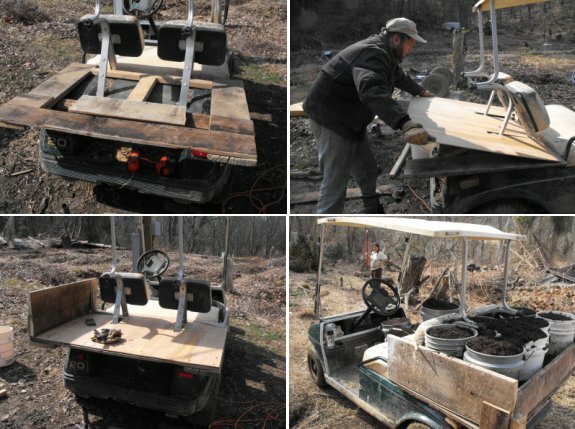 Total cost on this home made golf cart dump box was just over 5 bucks thanks to using scrap wood from the old house. It expands the back hauling capacity of the golf cart from 2 buckets to 7, with about 3 buckets worth in between the cracks. Next up is a wooden rack to take advantage of some space up front. Don't you already have a pickup truck? Naw, that's my brother's. Plus, it's not four wheel drive, so it can't get all the way back to the trailer. Our golf cart is our primary farm vehicle, so more hauling capacity is a definite plus! Were milk floats ever used in the US? If so, you should look into acquiring one. They were built to be stacked full of crates of filled glass milk bottles. That's quite a lot of carrying capacity. I'd never heard of milk floats, but now I wish they had them here! Good point on maxing out the golf cart. Mark actually added on another five buckets or so to what he showed in the picture, and realized that it was making the back wheels rub on the wheel wells. Looks like there are definite limits there. For traction often series-wound DC motors are used. These have the advantage of creating a huge torque when they are powered but not turning yet. The disadvantage is an extremely large current (only limited by the resistance of the windings) running through the motor at that time. This current generates a lot of heat in the windings, typically much more than the motor is capable of withstanding in sustained operation. As soon as the motor begins turning, back-emf will limit the current and therefore heat generation. This kind of motor is also frequently used as a starter motor for internal combustion engines because of its high start-up torque. I appreciate your concern, but we've pulled quite a lot of weight with the golf cart without any problems. Mark's modifications just expand the capacity we can carry on the cart itself, since hauling the trailer behind it often bogs down in the mud. I did some quick calculations and I don't think what he's hauling would weigh more than two beefy golfers. We've have the dump box for ten months now, and I can't imagine life without it. It really does make jobs much faster and easier! I'm glad to hear that we're not the only ones who cobbled together our own golf cart box.